In-camera, fast-cut Super 8 films of contemporary life, fairground rides, industrial wastelands, off-air footage filmed from the TV screen, and film loops are montaged onto U-matic video via multiple Super 8 projector playback; in a pioneering independent video production and distribution project from 1984, and forming the precursor to the film maker’s involvement and engagement in the Scratch video movement. Low budget, rough-edged post punk film and video making… distributed on VHS via Rough Trade records. By switching different projectors on and off at different times, a multi layered work was created, mixing live a variety of pre-planned and arranged sources of still and moving imagery, including pre-prepared film loops on some projectors. Four works were created with the specific intention of constructing their soundtracks a posteriori to the visual recording and edit. The video recordings of the projected image montages were taken into the Psalter Lane art college video edit suites and final versions cut together, that could then be copied off onto VHS tape. Working with Paul Watson, of Nottingham based 38th Parallel, in very much a bedroom recording studio set up; tape loops, synthesisers, bass, drum machines and percussion were built up on a simple multitrack recording facility whilst playing back the VHS tape. Film loops used included footage shot of Brion Gysin’s stroboscopic flicker device, The Dream Machine. Shot whilst on display in the Butlers Wharf B2 Wapping Gallery as part of the Final Academy supplementary exhibition in October 1983, where I had the pleasure of giving a copy of 391 magazine personally to William Burroughs. Traditional Bowel Movement also featured a production technique of shooting by means of the Umatic video camera, a Super 8 found footage film loop from an old Movietone News reel from the early 1970s featuring a clip of a young woman throwing paint over the British Prime Minister Ted Heath. The film loop was run live through two separate film projectors overlaid onto the same screen, resulting in two layers of the same image out of sync with each other repeating the moment Heath is hit by paint. The soundtrack features the voice of romance novelist Barbara Cartland extolling her views over a mutated version of the Beatles ‘All You Need is Love’. The soundtrack is an extract from a longer piece produced in collaboration with Andrew Hulme, for a multimedia live performance at Le Phonographique Club, Leeds, January 1984. The visuals are reconstructed from Super 8 film material I was using at the time for live multimedia performances . This material and footage from View From Hear would have been projected and montaged together onto multiple screens hung around the venue. Although not featured on View From Hear, this video is featured here to give an indication of the content from multimedia performnaces at the time. View From Hear in retrospect can now be seen as a pioneering project in independent video distribution, and contributes new knowledge to the study and understanding of independent and video art distribution practices. One of the earliest exemplars of exploring the potential that VHS and consumer and prosumer video formats could offer for D.I.Y production and distribution, following closely on the work of Doublevision and Factory/Ikon and predating George Barber’s Greatest Hits of Scratch Video compilations. Independent of both record labels and community and arts organizations, the work pioneers ‘D.I.Y.’ production and distribution of a practice that is purely audiovisual, distinct from music video and pop promo practices. 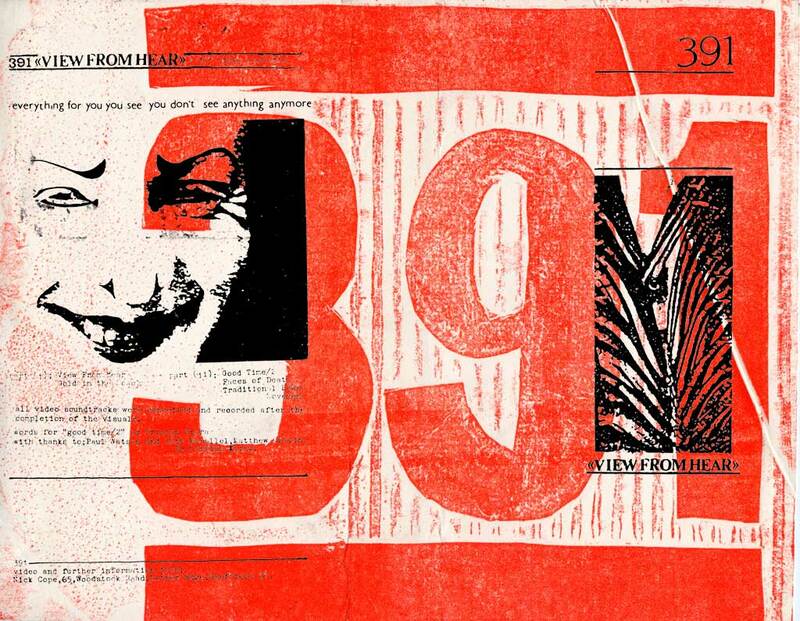 391 View From Hear video reviews, 1984/85. Dessa Fox, New Musical Express, p.21, 20th April 1985. Dave Henderson, Sounds, p.12, 28th July, 1984. 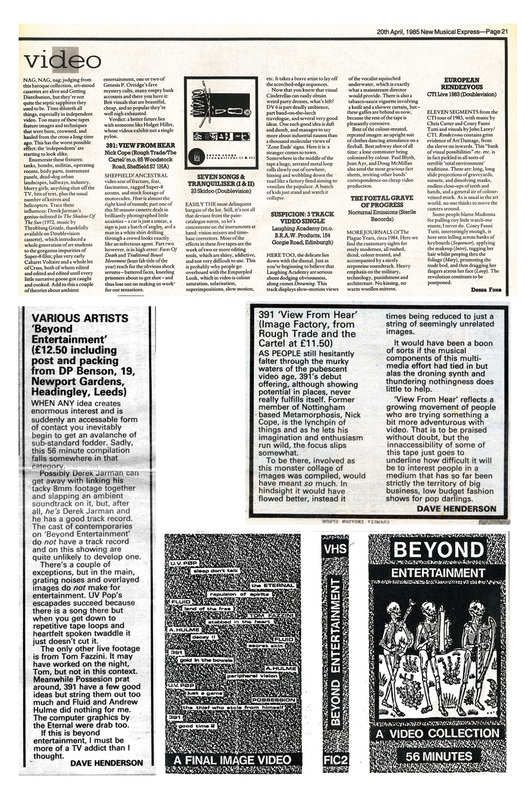 Gold in the Bowels in ‘Beyond Entertainment’ review, Dave Henderson, Sounds, p.10, 25th February, 1984. Beyond Entertainment VHS cassette cover, Final Image Video, Leeds 1984. Video Lounge, The Fridge, Brixton, July 1984. Released on ‘View From Hear’ (1983), Sheffield: 391 Image Factory.VHS cassette; independent distribution. Gold in the Bowels also released on ‘Beyond Entertainment’ (1984), Leeds: Final Image Video, VHS cassette. 391 Live Communiqué; Ad Lib Club, Nottingham, December 1982. Complex Event II; Le Phonographique, Leeds, January 1984. Complex Event IV; Termite Club, Adelphi Hotel, Leeds, March 1984. Media Arts Festival, Lanchester Polytechnic, Coventry, April 1985. Videotheque, Institute of Contemporary Arts, London. British Artists Film and Video Study Collection, London. See: Knight, J. and Thomas, P. (2011) Reaching Audiences: Distribution and Promotion of Alternative Moving Image. London: Intellect Press.